Going to the vet is no walk in the park, and chances are, your pet will most likely put up a fight or try to avoid it as much as possible. Luckily, if you live in the Los Angeles area, 911 Vets provides you with the convenience of bringing the vet to your home! With our mobile vet clinic, you won’t have to worry about trying to get your dog into the car or your cat into his or her carrier. We provide you with our expert vet services in the comfort of your own home. Whether you are in need of a routine check-up or emergency services, our vets will come to your aid at any hour of the day or night. Learn more about our services, and contact us at 310-341-0216 today! In our previous blog, we talked about a few ways to help make your trip to the vet as stress-free as possible. In part two of this multi-part series, we will continue to talk about some more ways to help your pet feel more at ease when it comes to visits to the vet. Continue reading below, and if you have any questions, don’t hesitate to call the experts at 911 Vets! In part one, we discussed how to help your pet become more familiar with the car and his or her pet carrier. Another great way to put your pet’s mind at rest on the way to see the vet is to make his or her pet carrier as comfortable as possible. Whether the carrier is just out in the open or you’re taking your pet to the vet, it’s important to make that environment comfortable. No cat or small dog will enjoy sitting in a hard, plastic carrier. Lay down a blanket or towel to increase the comfort level and maybe even throw in your pet’s favorite toy. The littlest things could help your pet feel a little calmer. For pets that are extremely anxious or nervous, you may want to consider using calming scents. Animals release pheromones that help to calm both themselves and other animals, and recently, companies have been able to create products that have the same effect. Most often, these pheromones come in spray bottles. Before you go to the vet, spray the towel in the carrier or the seat in the car with these pheromones to provide your pet with a calming scent. Once you’ve returned home from the vet, be sure to give your pet some space if that is what he or she desires. Visiting the vet is stressful, and just as you enjoy some downtime after a stressful event, so does your pet. He or she may run and hide, or curl up in their bed and sleep for a long time. Either way, give them some space until they show signs of wanting attention, but still keep an eye out for any bad reactions to shots or medication that your pet received during the visit. 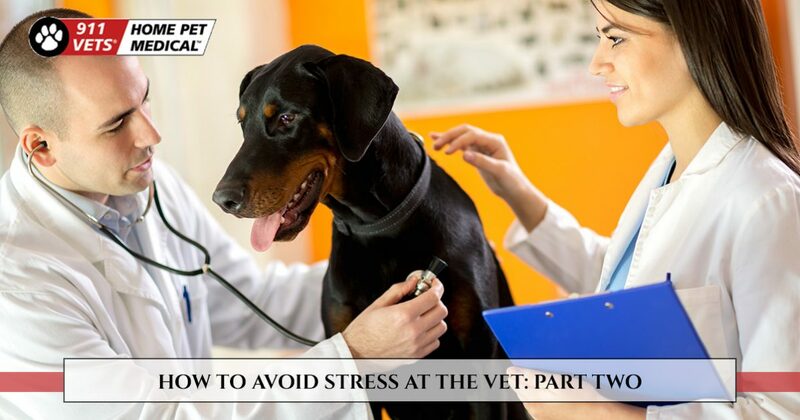 Hopefully, these tips will result in a stress-free visit to the vet. If you’re looking to minimize the stress by having the vet come to your home, 911 Vets can help! We are proud to provide the Los Angeles area with all the services that you can find at a traditional vet clinic, 24/7. Whether it’s an emergency or a cancer screening, we can give your pet the attention and treatment he or she deserves. Call 911 Vets today!